Wow what a year for me. 2018 was probably the best year I have had for 20 plus years. Reflecting on the past year, I couldn't have asked for anything more. This month is the anniversary of my breakdown 3 years ago. I realise my physical health isn't great & my mental health is work in progress. After all, with all the abuse I put myself through, I realise it's going to take time & continuous readjusting. But let me tell you, its so much better than the dark days. Even my down days I have a wry smile, because that's a million times better than before. I still work on 'slowing' my head down through breathing exercises & meditation. Also building on my strength, because I still have days where my body just gives up. So its just as well I have so many projects where I can push through if I needed to, especially if it is a paid job, knowing I can rest the next day. I do know I have too many projects at the moment. All things I love. I do need to streamline, which is what I am doing now. Within the next few months I will have to decide what jobs I do to pay the bills & be realistic with my other projects. I am having to discipline myself at the moment, so as to keep track of my class/book, which I hope I can put into practice by April. I managed to aquire a new laptop. This should make my job easier & there wont be any excuse to make regular blogs & new information within the web-site. I have timetabled a friend to come up once a week & for us to input data on each visit. Also for me to use social media more, so to spread the word of wellbeing/recovery & start receiving donations for that 'Communal Café'. Just wanted to mention that my relationship with my lady friend has been absolutely brilliant. She has gone back home & is hoping to come back for the summer. She did mention that the stress factor of London is immense; that with the dark, cold winters, doesn't make daily life much fun. Although saying that, we did utilise every discount you could achieve to make going out in London OK. For example we went to see 'Tina' the musical. This was fully booked for 3 months, except for on the day tickets. So I got on my bike, got to the theatre by 10am & got tickets for £10 each. It was a great night that didn't cost huge. Also popped in to the refurbed Opera House & spoke to Darcy Bussell (look at pictures) while she was doing a signing. I mentioned I was impressed with the program she did on dementia, where it has been found that dancing & singing keeps dementia at bay, which is another thing that kids should be given access to from an early age. I have done so much with my partner, we egg each other on & that's very important to have people around you who understand that. And lastly, I have come to the conclusion; I have to be very strict on who I call friends. I have realised I only have a handful of friends I can use. Here again, you have to acknowledge that they have there own lives to run. That's why I use all of the wellbeing societies. But I never see them socially. So I do need to go & do other things with other people, especially while my partner is not here. Otherwise I do stagnate & get lazy. Maybe a sports/dance club. I have tried before but unfortunately I need to find a club that's within my budget. So remember, use the wellbeing clubs to the full. Position yourself with work & projects to have time off when you need it. Save money with food budgeting & healthy tasty foods. Build up your strengths by doing simple breathing exercises. And lastly, be honest with yourself about 'Who are your real friends'. Hi everyone, I really am no good at updating regularly am I. My energy levels still go up & down. So, this last week I started my ‘No Label Diet’ & low & behold within 2 to 3 days I moved up a level of energy. I used it to relax, by reflecting again on all the things that have happened to me this year. I am going to do a full month of getting my body & mind in shape through eating tasty, healthy food. I am in a relationship & its going more than great. I will leave it there, except to say I hope I don’t screw it up. Through my mentoring at Turning Point I have succeeded in receiving an innovation fund to begin formulating a four hour, one day a week (for six weeks) cooking course. This would include food budgeting & things that helped me feel better; basically, using food as your boost, to gain confidence, to then inject discipline to step forward. To learn to accept emotions & to deal with them, through basic fresh air, sun & breathing exercises. By the way, it will be light hearted & fun I hope. You've got to be careful what you wish for; although I didn’t think I would be teaching but it seems to have arrived. Now, to say I am scared is an understatement but I really want to do it. I am busy trying to timetable myself, so I can collate all the information I have gathered in my head & done. I am also asking for support. I have given myself till next spring to have it finished. In the meantime, I have a Sri Lankan meal to prepare for 35 people & a conference in December, to talk about food, making health & gaining confidence. Again, a lot of scary moments for me. My way of thinking is if I practice what I preach I should be alright, fingers crossed. Hopefully the next time I write my blog I would be using my social media better. Ok, another couple of months have gone by. I have had a lot of emotions going through me. Also another birthday has come around. Life is moving along. I am still trying to be honest with myself with what makes me happy. That is to say, with my work. At the moment it is still a bit all over the place. I have just finished a course (ideas into actions/innovation funds), to receive some funding to give back to clients of the charity I have used. In doing so, will hopefully be using the template to formulate work. Also, there is a proposal for a bigger job within the community. This is a difficult one, as it means really focusing & asking for huge support, while trying to earn a living. The trials & tribulations of life eh!. What I do realise is that every now & again I feel my old insecurities rising up. So, I have to make sure I don't overload myself. I still sometimes try to run before I can walk. God! sometimes it's tough. These are the times I have to slow down & make sure I do my breathing exercises, take time out & talk to the ones close to me. Importantly using the tool of 'reflection'. I have come a long way but I have to be careful that my old traits are noticed & try & nip that in the bud. I also have started some self meditation & self healing, which really means' listen to your body'. I am pleased to report after blood tests, I have had the all clear. This always amazes me considering how much I abused my body. My mind is catching up slowly, just need to continue as I am & not worry. Lastly, I will again say that I need to update my web-site every week. So I am going to have a meet with my pal & start timetabling myself. Maybe the next blog will be more precise as to where I am at. Oh, looks like football has come home. The boys did us proud!!!!!!! 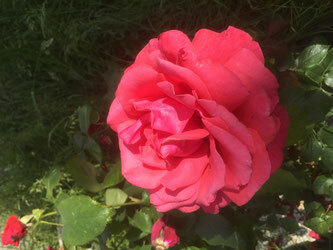 The photo above is the rose bush that I transferred from the communal front garden, to my dad & mums grave. My mum planted it years ago & as you can see, transferring it has not done it any harm. Maybe my mum is still looking after it & that includes me too. Had a moment & thought I better update my blog. I am on a course to help me apply for funding for a certain project. That 'pie in the sky' idea for a community café. The more people I talk to about it, I realise that it is a great idea. I wrote that plan roughly over a year ago & I am pleased that I am still on it & the fact I am preparing by going to these courses & asking for support amazes me. There are people who will support you. That's why for me it was important to work within my local community. It also feels safe, as it is an area I know. In addition giving back to the organisation I self reffered too, two & a half years ago, which entails supporting people who are in the position I was in, does in fact give me energy to stay on track with my life. I still have problems sleeping but the plus side is that I am alert when I get up & look forward to the day. I am still researching why I keep waking up in the middle of the night. I am growing Valerian & camomile to help me sleep, as I don't want to start taking pills. Ok, had to write something before I get wrapped up with all the things happening in my life. I have a new section on the website for new projects & I will be filling the sub headings as I go through the weeks. Since I have been back & got over the excitement of the amazing time I had away, a lot of situations occurred. Firstly a great friend of mine, actually the person who has stayed with me once a week in the last two years to support me, had a turn himself. Life has caught up with him & he has realized he has been living with things that have now caused him to have a breakdown. It just goes to show you, to be honest with yourself can be the hardest thing in the world when you are wrapped up with a hectic city life. Hopefully I am now being more of a support to him. It's amazing to see similar traits he is going through. I must say he is doing well, although it will be a working progress journey. After two weeks of being back I got the holiday blues, the doom & gloom of people in general & the grey skies with continuous rain didn't bode well with me. I tried to do too much & got run down. I think it's the fact I have given up smoking, I am now on a vegetarian diet but also including fish. I wasn't drinking alcohol & not really sleeping well. Then I got struck down ironically with Aussie flu for 2 to 3 weeks. It did knock me for six but as I have mentioned, I am going through a transitional period with my health, both with body & mind. I was given mantras to read morning & night from the spiritual healing center specifically tailored for me. Now, whether you believe in this or not, one thing it does do is help you concentrate on the tasks ahead. I did go for bold risks for myself & I was receiving reactions. I now have to step back & timetable myself to balance my volunteer work, my courses, health program & of course work to pay the bills. This certainly takes its toll, hence my sleeping patterns are all over the place. I have to have patience, its not easy, but its something I have wanted to do all my life.......I am sure in time I will zone into exactly what's good for me. Am I enjoying it............damn right I am. needn't have bothered to think like that. I had the best time of my life. Jigsaw pieces of my life started to fit into place. This has given me a wonderful confidence & dare I say it, to be bold & step forward & take a leaf out of my dad's soul & help people, especially with my life's journey. I have always been told I was the 'Golden Child' mainly because I was very successful early on in life. Although I seemed to have done well I had no guidance & no 'well done' so I always thought I wasn't good enough. Through my insecurities this created a low self esteem & I didn't know how to succeed in relationships or indeed love. I had a beautiful wife & lovely daughters & I let them down & so lost them through having massive binges. Maybe I am the 'golden child' because of my journey. I have somehow survived & because of the experience I will try & help people. I just wanted to mention the retreat. I was lucky enough to be taken in, as the lady running the place wanted a rest. she did take me in because of what I said to her. This was a relief. Here I was getting one to one attention, as normally there would be a minimum of 4 persons. I felt extremely privileged. Let me tell you I got a massive boost from it. I think I was so open to it; its made me so strong now. As the new family member who gave me a loving arm of guidance & belief said, 'Don't put yourself down, you have done enough in your life, to prove you can move forward & hold your head high, because you are worth it'. I have waited a long time to hear those words. Thank you. Apologies, I have neglected the site for almost 3 months. Just goes to prove in takes time to get through 'well being' moments. I have been so busy, researching my diet & health; testing myself with certain foods & what works best for me; rule of thumb, 1/4 carbohydrate, 1/4 protein, 1/4 vegetables & salad.Oily Fish 3 times a week, daily eat a variety of fruit 5 times a day at equal separate times & use olive oil & rapeseed oils.. No processed foods or sugars. I think we all know this to a certain degree. There are also wonderful recipes which are exciting & tasty. I will be organized one day soon & start to apply all the foods I eat on the food budgeting page. Don't forget a well oiled machine gives you the best possible chance to energize yourself to start helping yourself. I have been doing my breathing exercises (qui gong), as for me this is a must, as it gives me so much clarity; hence, why I have delayed my blogs. A vast amount of stuff has come up. This is where I have used my support system, my wonderful daughter & the very few friends who stay close to me & of course all my wellbeing charities. Check out https://roadstowellbeing.communitymaps.org.uk/welcome. The main thing is I am using this so called 'Gap year' to take my time & learn in small steps about re-patterning myself & most importantly with joy. That's why, when 'stuff' was coming up; I could deal with it & slowly move on. I still have kept my 'cycling everywhere' in all sorts of weather, it seems to give me a kick. A 2 for 1 outcome. Saving fares & exercise; just thought of another one, always on time for appointments. I have also gone through a diabetes courses & a healthy hearts course. As my cholesterol is high I have got to look at my diet even closer. I have also done an 8 week credited Peer Mentor Support course, which I am proud of completing & graduate soon. I really didn't think this was for me (can I be that patient); well I thoroughly enjoyed it (recommended by my mentor, through Turning Point). It's opened up doors to volunteer with various charities & projects for a possible placement & that's what I am doing now. So, you can see I have been very busy & still have to pinch myself that I am enjoying the moment. Hi everyone! Well it's been a long time since the last blog. I have had to make a few decisions, as I was feeling a bit of pressure to keep increasing my business (increasing my monies), especially if I have written out a 10 year plan, so I had to stop & realise that I am still recovering from a lot of abuse to my body & mind. Although I am extremely pleased with my progress, I have found that I am not ready to go on a full assault on business making ideas. I had a 'Christmas Hamper' idea with information I've collated over the last 6 years, I even have a network presentation date in September, all paid for. I will receive a refund, thank god). To organise a sample hamper would have cost me all of my monies. This caused me too much stress, so I decided to continue on my 'gap' year. Next step is to further improve my understanding of nature, in turn supporting my mental wellbeing. So I am enquiring about 'bee keeping' & possible animal care. I am maintaining a living with my one clients in catering & being a steward at Lords Cricket Ground (a real joy) and am looking for odd gardening jobs as well. This should pay my bills & help me stay on my courses. I will be hopefully doing an 8 week course (one day a week) with Turning Point to be a Peer Mentor, which I think will help with my project (10 year plan) in the future. In the meantime, I am continuing with improving my health. I go to the gym at least once a week. I have a Chi Kung class I go to once a week (will give you details when I finish the course). I have been making up 'green shakes' once a day mid morning & a 'pure fruit shake' in the evening and keeping my food home made. I am in the process of combining up to 10 'fruit & veg' per day in my diet. I have been taking pictures of my meals & making notes on how much these things cost, but unfortunately still rubbish at technology & inputting into Social Media. I NEED HELPPPPPPPPP!!!. One step at a time Jude! Very frustrating, hence the delay from my last blog. Lastly, 'a bee in my bonnet (my Tibetan hat) moment'. I have been to a few wellbeing meets & the information given out, is how to relax & use breathing exercises to clear the body & mind. My question, why do we only receive this information when we are older and in trouble. Why not introduce it at the age of 5. This would mean as you get older, there is a much more beneficial aspect to life. It's not rocket science. If for example you buy a Rolls Royce, would you put the worst oil, petrol & components in it. Even if you buy second hand you would do the same to get the best performance & reliability. Unfortunately for me, my body is taking it's time recovering because of the bad components I have introduced, which in turn effects my mind. Well unlike a car, my body & mind is not ready for the scrape heap. I know it will recover, it just takes time. Going through all these frustrating moments, is much better than the place I was for the last 20 plus years. Two three weeks since the last blog. So much has happened politically & with horrible deaths. Sad, sad times. I get the feeling that this is the time for community. Enough is enough. Let’s find the root of this problem & maybe choose a different path. After all, the situation we are in isn’t anything new. History seems to repeat itself. When I was growing up there was ‘Love & Peace’, ‘Wars’, ‘Oh the youth of today’, Racial Tension’. Conflicting & misinterpretation of views with Religions, Strikes, Equality for Women, ‘The Rich & Poor divide; it seems not much has changed; maybe it’s time to step back & start supporting each other. Hey, I have had my rant, now lets get on. Last time I talked about doing Zumba dance classes, well it took me 2-3 weeks to make that phone call to book an over 50’s class. I met some lovely ladies. I was the only guy. Thoroughly enjoyed myself, but still find my co-ordination is all over the place. I need to practice every day I think. In the meantime, I will try & go every week; especially when the Westway gym have these classes added in with your membership. The other thing which was amazing was my weight. I have worked out, that when I plateau & stay on the same weight for weeks although I am on this healthy diet; frustration sets in, then I noticed I suddenly lost half a stone in a week. Just must be the way my body works. The great thing it has done for me is, consolidated that what I am doing is working, which then gives me more internal strength. Other great news is that I have passed my level 2, fruit & vegetable, city & guilds course. Very pleasing. So still using my front garden patch as research for next years ‘design’. See, recent pictures. Although I have used raised beds, those ‘pesky' pests like slugs & snails find their way in. Talk about slow & steady wins the race. My teacher says I should go outside when it’s dark, armed with head torch & I will hear them munching as well as see them. Can’t say I have done that yet. Shall I give it ago? Can’t believe I said that. Also, working on more food-budgeting menus & very basic exercise videos. I will be in them, so just summoning the guts to do that. 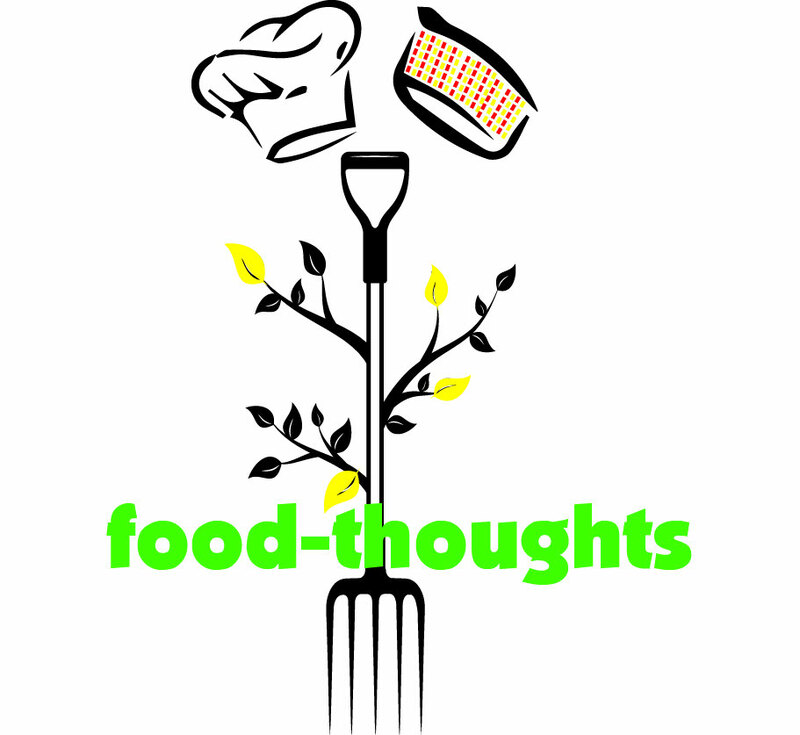 Food-thoughts web-site is evolving slowly. I will be able to spend more time with it now. I have had my first committee meeting (6 people); these are people giving up their time to support my project. Although I am using my outside catering skills to find work. I have also started to concentrate on ‘Christmas hampers’. Yes, you heard right. I need to have samples ready by September to show possible clients. I have booked a networking session with a lot of wanabies. So any extra monies will be spent on that, to hopefully sell sufficient numbers to re-invest for that ‘Community Café’. Lastly, had my first donation. Can’t believe this has happened. 18 months ago, I wrote a list of things I would like to do. Looking at the list I thought realistically this will take 3 to 5 years. I seemed to have touched most of the list except for two things. Not to sound to ‘sickly’, but maybe, just maybe I am beginning to enjoy the moment. Within the next two to three weeks I would have combated my fear of social media & put out everything I mentioned above. It’s been about 3 weeks since I launched my web site & although I am receiving huge amounts of support I have hit a brick wall. Previously I was hitting 2 steps forward & 3 back. Now, I would like to think I am making 2 steps forward & 1 step back. I certainly felt exhausted. I realise now I used to attack ‘life things’ with vigour & excitement & run things at 100 miles an hour. Then, suddenly, a ‘black hole’ an ‘emptiness’ & a ‘very weak body’. The reasons why this is happening? Well, I can break it down, although it is a slow process, so many layers forming my patterns. So now, I have patterned myself to stop, rest & enjoy the moment. The biggest present given to us is the present. Something I don’t do & trust me, it’s something I find hard to do. This time around I didn’t punish myself & I could see the good things I have done. I pushed myself to go to my writing club with ‘Alliance depression’. My mind was out of sorts, but I was glad I went. I did light exercise at my gym & had a steam with a cold plunge every 2 to 3 days. Slowly, but slowly I came back. Importantly I didn’t stuff myself with ‘grease & sugar’. The weird thing this time around was I didn’t want to. I do have healthy green shakes & fruit shakes. Never thought I would say this, I like them and within just a couple of days I felt the benefits. Within a couple of ‘weeks’ people noticed the difference, especially in my face.